This field is known as the How Did You Hear About Us? field. It can be shown at the top of your Web Registration Form and Quick Registration form. With your Online Web Registration Settings you have the option to require this field for online registrations, make it an optional field, or hide it completely. 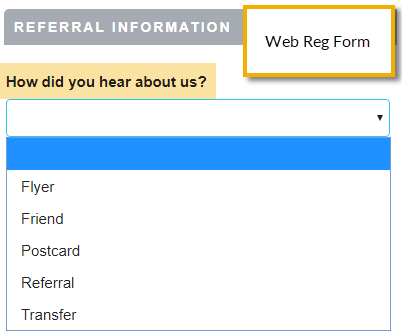 New families will be able to let you know how they heard about you using this drop-down list. This information can be helpful in measuring the success of promotions or advertising efforts. Examples are Flyer, Facebook, Website, etc. You can report on this data using the Source Report located in the Email / Text / Marketing category in the Reports menu. Create and manage your Family Source drop-down values from the Tools menu > Edit Settings > Drop-down Lists. You have the option to hide any of your Family Source drop-down list values from your customers with the Hide from customers checkbox (hides the value from your customers in Online Registration and Portal drop-down lists) or you can choose to hides a value in drop-down lists within Jackrabbit using the Hide from users checkbox.